Combining indoor refinement and outdoor glamour, these suites are the epitome of Sandals luxury. Set at the resort's summit, each boasts the island's best ocean views – uninterrupted for 180 degrees. This spectacular resort within a resort serves up stunning ocean views from its dramatic bluff-top setting. This is your ultimate paradise hideaway where romance flourishes and lavish pampering puts you on top of the world. 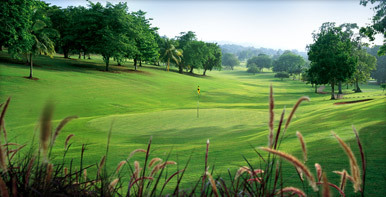 Masters of the game and beginners as well will thrill to the lush landscape of Regency’s challenging golf course. Rolling hills and majestic fairways inspire performance at all levels, and complimentary green fees invite repeat plays at leisure. The stately palms that grace the mile-long entrance into the legendary La Toc Estate are the awe-inspiring prelude to your vacation at the Caribbean’s Most Glamorous Resort, Sandals La Toc. Recognized as the most sparkling jewel in the islands, the “Emerald of the Caribbean” glitters invitingly along the half-mile crescent shaped beach, cradling exotic coral bluffs, lush hillsides, and rolling fairways. Cradled within a true rainforest on the simply beautiful island of St. Lucia, this 210-acre masterpiece estate features the Sunset Ocean Bluff, a resort within the resort, flaunting breathtaking vistas from bluff-top villas with private intimate pools. Indulge in Five-Star Diamond French cuisine and other tantalizing faire from around the world in nine spectacular restaurants. Revel in the island’s largest pool. Inhale the sweetness of flowering gardens. Advance your golf swing at the resort’s executive golf course. Live a millionaire’s life with your own private butler. 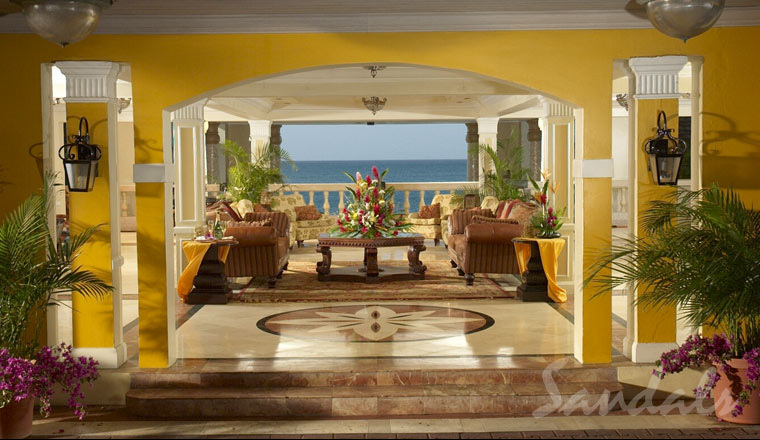 At Sandals La Toc, you’re surrounded by glamour and wrapped in the sense of entitlement you deserve. 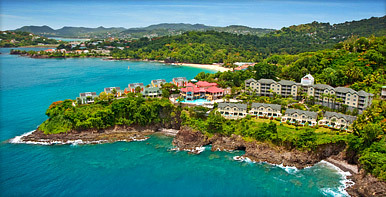 Located in Castries, Sandals Regency St. Lucia Golf Resort & Spa is 10 minutes from Vigie International Airport, 1 hr. 15 min. from Hewanora International Airport and 15 min. 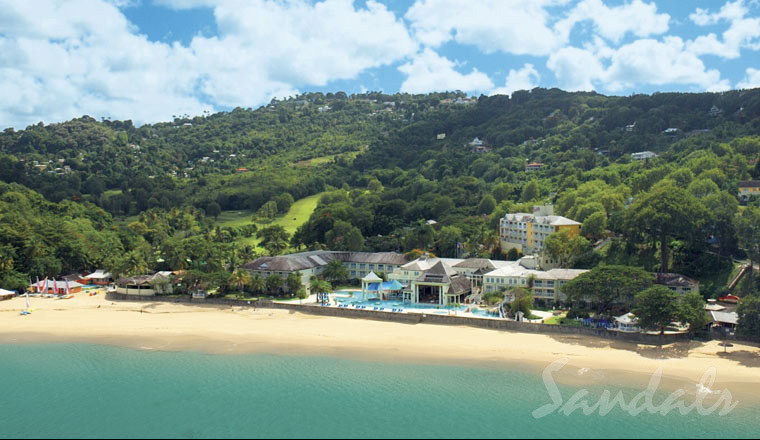 from Sandals Halcyon St. Lucia or Sandals Grande St. Lucian Spa Resort. - All rooms at the resort now have refrigerators and are serviced daily with water, juices and soft drinks. - A PADI viewing room has been opened at the Watersports department (near the dive pool) where guests can watch the Introductory PADI Dive Certification video. The dive instructor is also present to answer any questions guests may have prior to their dives. Premium, Luxury Beachfront, Grande Luxe Beachfront and some Grande Luxe Ocean views have a French Balcony (no walkout balcony) but ground floor have a patio. These rooms have been fully refurbished with plasma televisions and whirlpool tubs. Personality: Glamorous 210 acre estate with a large assortment of luxurious suites. Features: Sunset bluff; Golf on property, Stay at 1/Play at 3 with access to 18 Restaurants, Private transfers for top 3 suite categories. 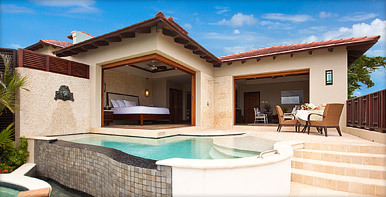 Large selection of suites with private pools; Magnificent Millionaire Suite.